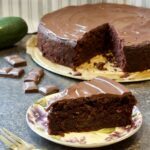 This super easy and “not so good for you” Chocolate Courgette (Zucchini) Cake is super moist, fudgey & oh so chocolatey. It’s a chocolate cake with a difference and with added veggie goodness that will surprise the biggest sceptics. No taste of courgette (zucchini) at all, just pure chocolate heaven! I must warn you from the start, this cake is not even remotely healthy, sorry. Ok, it does contain a vegetable plus substantial amount of good quality dark chocolate so maybe a bit. Ok, let’s say a bit! What it is for sure though, is super moist, fudgey and oh so chocolatey! This really is one of the best chocolate cakes I have ever eaten! As far as courgette (zucchini) is concerned you REALLY cannot taste it! Yes it’s there (lots and lots of it) and it provides goodness (of course!) and moisture but that’s it. All you can taste is gorgeous chocolate! That’s what it’s all about! 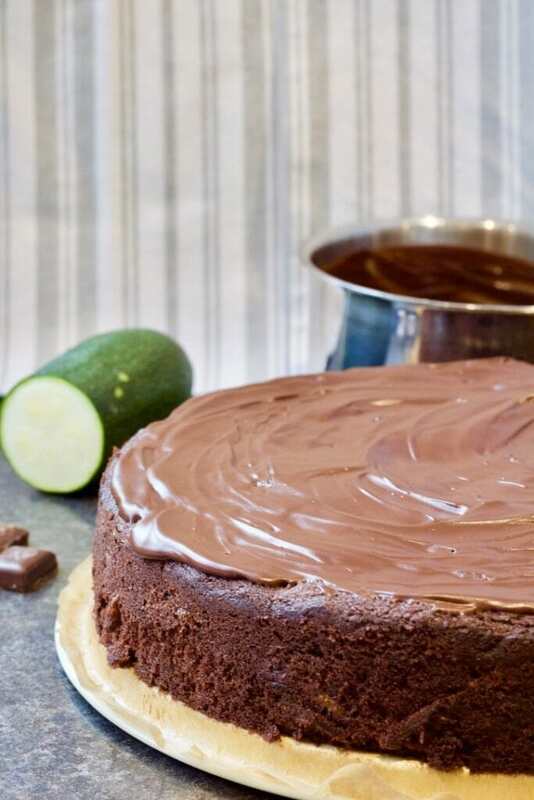 Useful tips when baking Chocolate Courgette (Zucchini) Cake! There is no need to peel courgette (zucchini) before grating. However if you are using overgrown specimen you might want to scoop out and discard the seeds. You won’t have to do this when using young vegetables. To grate I use coarse side on a standard box grater. Courgette (zucchini) contains a lot of water so once grated pop it onto a sieve over the sink and try to squeeze as much liquid out of it as possible. Alternatively, you can use clean tea towel or a muslin cloth to squeeze the liquid out. Make sure you start checking on your cake about 10 minutes before the end of recommended baking time. Baking time will be strictly related to the size of your tin. Do your first skewer test and if not clean, give your cake another 5-10 min and check again. Repeat if necessary. If you are using similar cake size to mine (25 cm round springform tin), it should take approx 50-55 min for the cake to be ready. When you start adding dry ingredients alternating with yogurt/sour cream, make sure you ONLY mix until the ingredients are incorporated. DO NOT overmix as this will result in a denser cake. All the ingredients should be at room temperature. Sieve flour, salt, cocoa powder, baking powder and baking soda and put aside. Instead of sieving your dry ingredient you might want to use my little hack and give them a mix with a whisk (yes your regular kitchen balloon whisk). 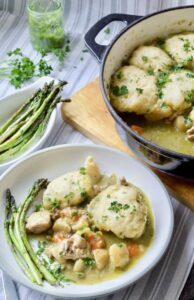 This will aerate all of your dry ingredients and get rid of any lumps. Put butter and sugar in a large bowl or bowl of your standing mixer and mix together until light and fluffy (use paddle attachment on your standing mixer or a hand blender). Add eggs one at a time and continue mixing. Gradually add oil and vanilla. 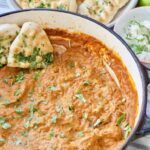 Add sieved dry ingredients in three parts alternating with sour cream/yogurt. Mix only until all the ingredients are incorporated, do not over mix. Add courgette (zucchini) and chocolate chips and fold them in gently. Put the mixture in a baking tin lined with baking paper and bake for approx 50-55 mins at 160C/320F/Gas Mark 3 until the skewer inserted into centre comes out clean. Take the cake out of the oven and let it cool before spreading chocolate ganache. To make ganache, put butter and chopped dark chocolate in a pan on low heat and mix until melted and combined. Cool slightly, spread onto your cake and enjoy! 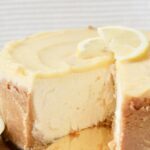 This delicious cake can be kept at room temperature in airtight container for 2-3 days or up to 5 days in the fridge. If storing in the fridge bring it to room temperature before serving. You can freeze the cake including ganache for up to 4 months but make sure that the ganache is well set first. It would be best if you pop it in the fridge first to firm up as it will make easier to wrap the cake in preparation for freezing. Make sure you wrap the cake tightly in cling film and aluminium foil or alternatively pop cling film wrapped cake into plastic container. Defrost at room temperature. This super easy and "not so good for you" Chocolate Courgette (Zucchini) Cake is super moist, fudgey & oh so chocolatey. It's time to get baking! All the ingredients should be at room temperature. Sieve flour, salt, cocoa powder, baking powder and baking soda and put aside. Put butter and sugar in a large bowl or bowl of your standing mixer and mix together until light and fluffy. Add eggs one at a time and continue mixing. Gradually add oil and vanilla. To make ganache put butter and chopped dark chocolate in a pan on low heat and mix until melted and combined. Cool slightly, spread onto your cake and enjoy! Nutritional information is approximate, per slice and a guideline only. There is no need to peel courgette (zucchini) before grating. However if you are using overgrown ones you might want to scoop out and discard the seeds. You won't have to do this when using young vegetables. Store at room temperature in airtight container for 2-3 days or up to 5 days in the fridge. If storing in the fridge bring it to room temperature before serving. Update Notes: This post was originally published on 7 March 2017 and updated in March 2019 with some more useful info. Have you tried my Chocolate Courgette (Zucchini) Cake? Leave a comment at the bottom of this post, I love reading them! Pin Chocolate Courgette (Zucchini) Cake For Later! Tried this last week, it is delicious!.. being coeliac I used gluten-free flour which can make dry, crumbly cakes, but I added zantham gum and a little glycerine and it stayed moist until we finished it … lovely cake or pudding … thankyou! Wow now that just looks incredible! I love courgette cake but never added chocolate before! I must try it, thanks for sharing this! This look sooooo good! I’ll have to give it a try , yummy! Ive pinned to try later. I keep meaning to make a courgette cake and this looks like a great one. This looks delicious! I’ve baked with courgette before and loved it, but never thought of adding chocolate! This looks sooooo delicious Jo! I have to admit that I’ve never tried caugetter cake before, but hearing your words of it being super moist and fudgey (and super chocolately – always a winner!) I know it’d be popular with our family! Pinning. I love chocolate zucchini bread but this cake version looks even better!!! Thank you 😊 That is chocolate heavy stuff but oh so good!